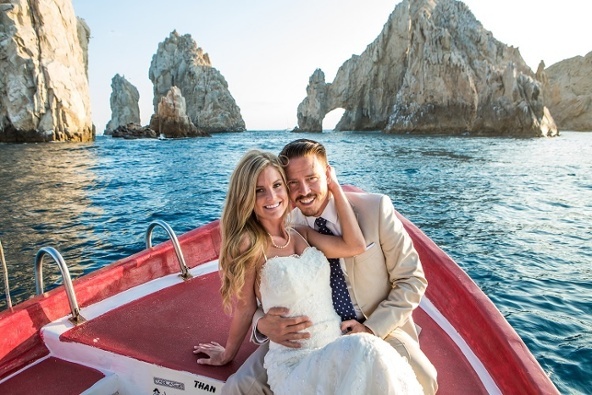 Most creative photoshoot location – when Kimberly and Nichol chose to exchange vows in Cabo San Lucas, Mexico, they knew they had to take advantage of the infamous El Arco rock formation nearby. That’s why they didn’t pass up the opportunity to hop on a boat and shoot some gorgeous wedding photos while they could! Hats off to you, Kimberly & Nichol – we love the creativity! Best use of color in wedding dress – Don’t think it hasn’t caught our eye that blush wedding dresses are on the rise, and with Rose Quartz being one of Pantone’s 2016 Colors of the Year, we’re expecting this trend to take off even more in the coming months. 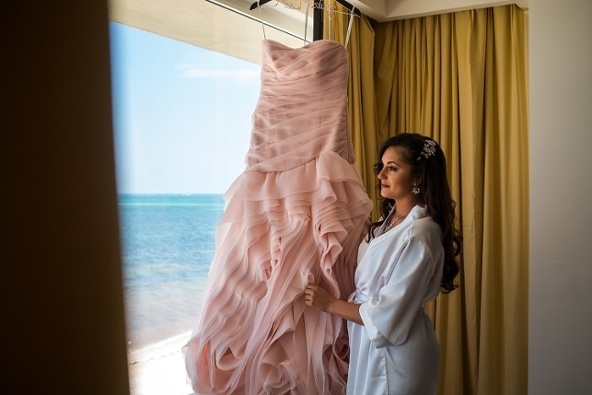 Arlene was ahead of the curve when she chose this elegantly-hued wedding dress with a fun skirt to add some ‘destination wedding’ flair to her big day. And we couldn’t be more inspired by her choice! 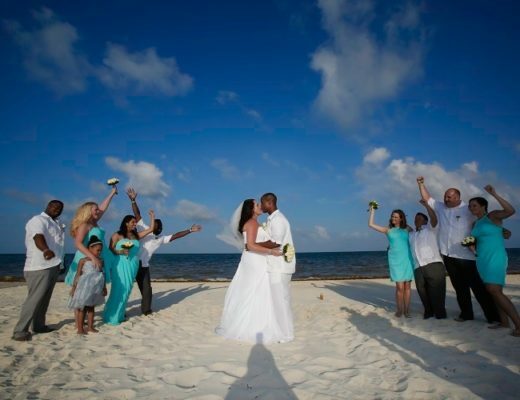 Best non-beach reception – let’s face it, we’ve see a lot of beach wedding receptions in our day. 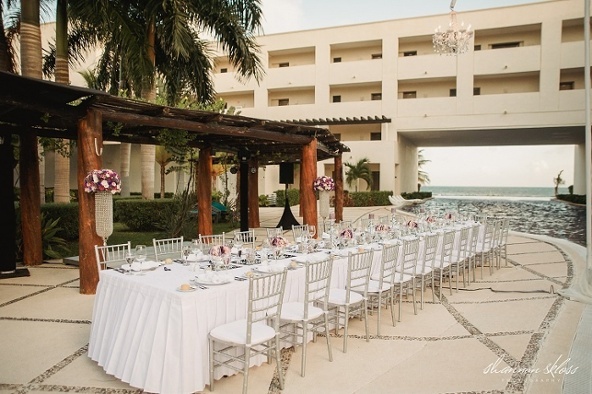 So it’s no wonder when Yvonne & Abe chose to host a magnificent poolside reception that it grabbed our attention. We love the way the muted wedding colors play on the neutrality of the hotel décor, making this one of our favorite reception setups to date! Best use of lush garden surroundings – we’re giving kudos to Belinda & James who took advantage of the Dominican Republic’s natural environment for the backdrop of their wedding portraits. With so much greenery to spare, it’s impossible not to get a fantastic shot like this one in Punta Cana! Best traditional venue – There’s no need to sacrifice your religious values when getting married away, and Dayna & CJ knew that when starting to plan their celebration. 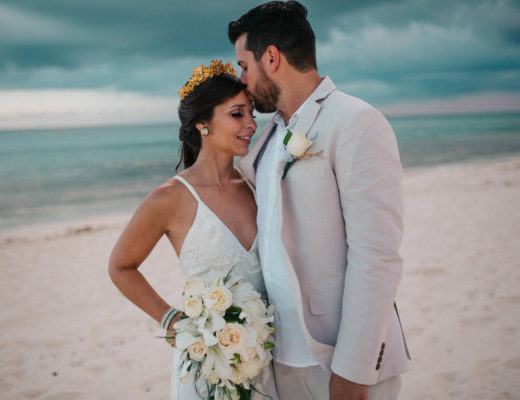 They chose to have a traditional Catholic (seaside) ceremony in Cancun – yes, Cancun – and it couldn’t have turned out more beautifully! Best personalized guest favors – Fun and fabulous was the theme of Selena & Joseph’s beach bash in Jamaica, and they didn’t spare any details. 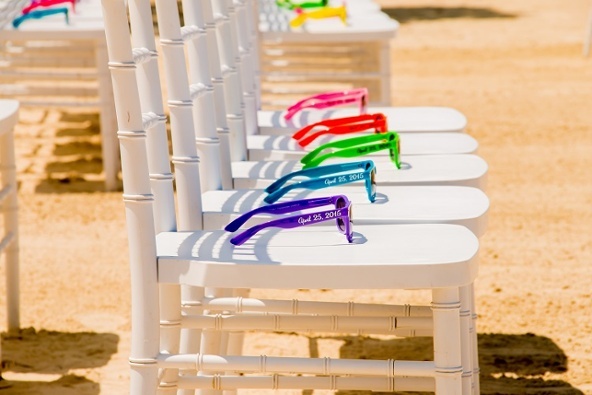 They chose to bring bright colors to their beach ceremony in the form of personalized sunglasses for each of their guests – this fun and practical favor is definitely approved by us! 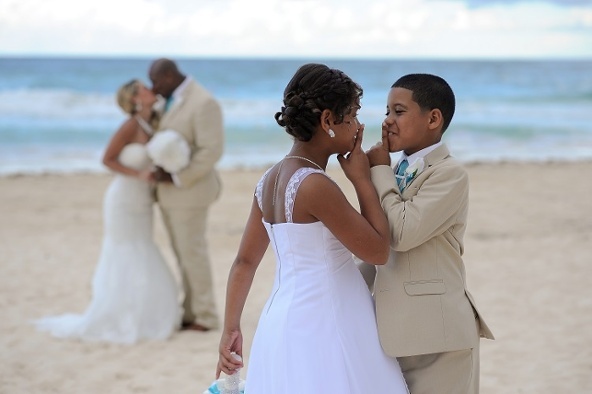 Best way to incorporate kids in your photoshoot – destination weddings can be a family affair, and why shouldn’t they be?! With so many adorable ways to bring your flower girl and ring bearer to the forefront of your photos, this pose is one of our favorites! 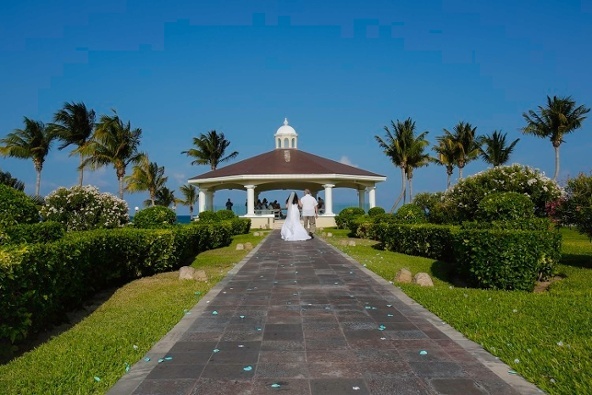 Best shoes for the bride and groom – When Leslie & Robert decided to get married away in Cancun, Mexico, they knew it would be memorable. But they chose to make it extra special by personalizing the details to their own style – even down to their shoes! 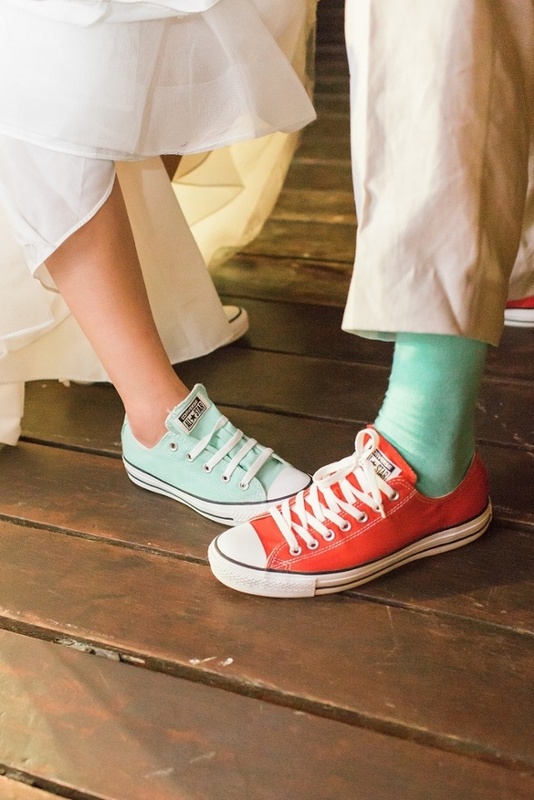 And we can’t complain, the colored Converse make such a fun statement, especially for a beach wedding! 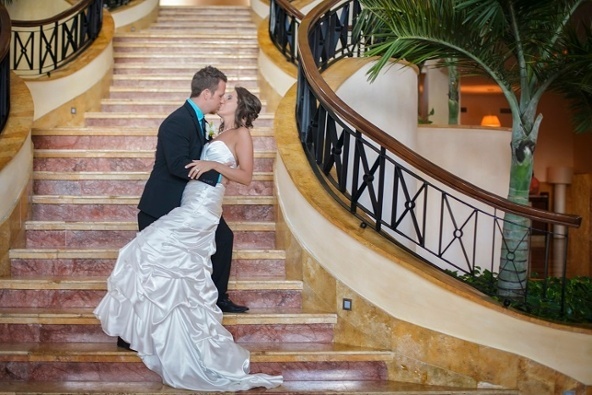 Best use of hotel décor – Kayla & Brian’s intimate elopement on the beach was breathtaking, but when they chose to take some portraits inside on their resort’s beautiful staircase, we were simply blown away! Taking advantage of the intricate architecture was so unique and really brought out the best in their destination. 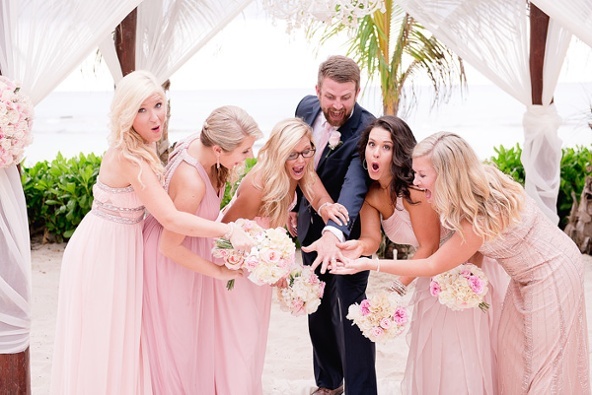 Best photo of the groom with bridesmaids – We’ll admit it, we’re a sucker for a humorous groom! And Zach did not disappoint when he captured this moment with his bride’s entourage. A little personality in your wedding album goes a long way, and this photo is sure to make the cut! 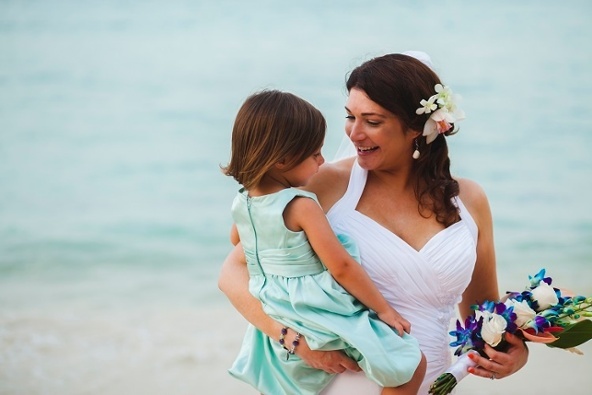 Best tropical bouquet – One of the best parts of having a tropical wedding is getting to take advantage of the native flowers. 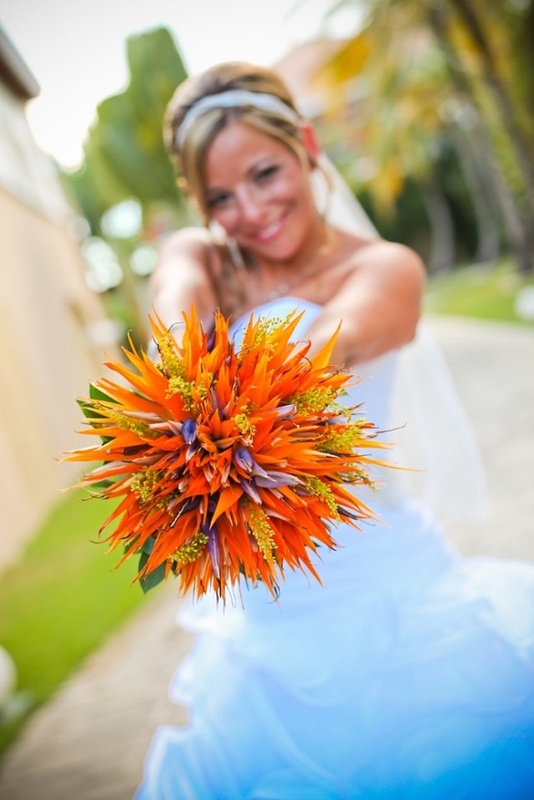 Wendi opted for a bright and beautiful Birds of Paradise bouquet, which brought so much local flair to her details. We love the bold statement and pop of color! Best DIY detail – With Pinterest being hotter than ever, brides are starting to DIY their wedding details with more confidence – and we’re all for it! Melissa dove right in and made her bridesmaids the perfect barefoot sandals for her beach ceremony. Hats off to you, Melissa – they came out great! Best group photo – When life hands you a destination wedding, embrace every moment! And that’s exactly what Priya & Jigar did when it came to taking photos with their wedding party. 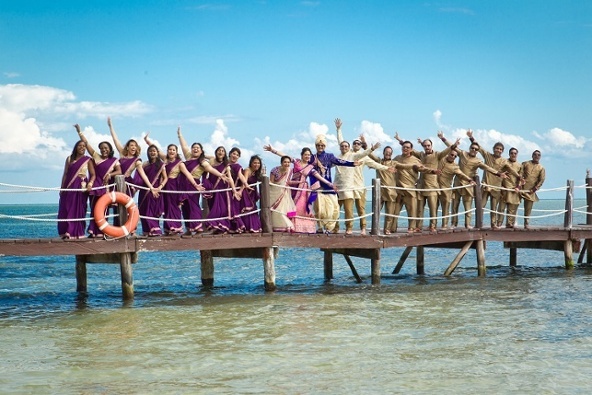 We love the spontaneity a wedding abroad brings, and this wedding group did it right! 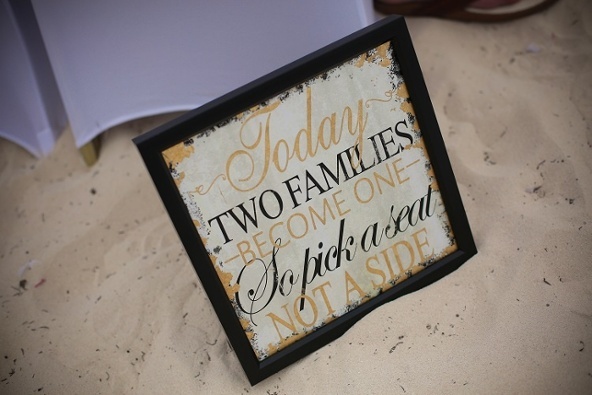 Best wedding sign – Weddings are all about bringing two families together, so it was fitting for Amy & Anthony to incorporate this sign at the beginning of their ceremony. Together, surrounded by their loved ones, they exchanged vows and danced the night away as one big happy family! Best candid moment – A photographer’s job is to capture the special moments of your big day, and that’s just what Amanda & Adam’s photographer did through this photo. The pure joy on the bride’s face says it all, and makes us all realize the purpose of such a happy celebration! 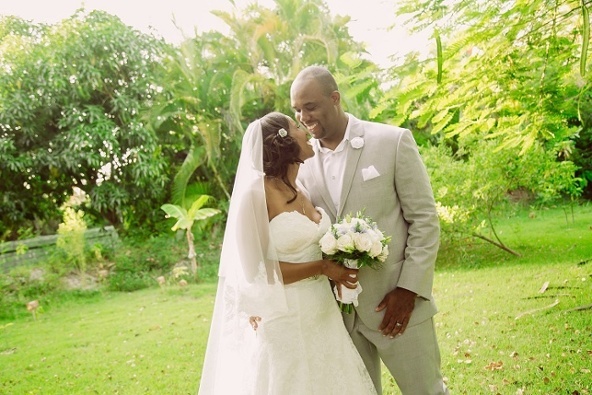 Fifteen photos do not do the justice of all of our fabulous real weddings. So for good measure, we’re ‘sending you off’ with a #16 to help ring in 2016! 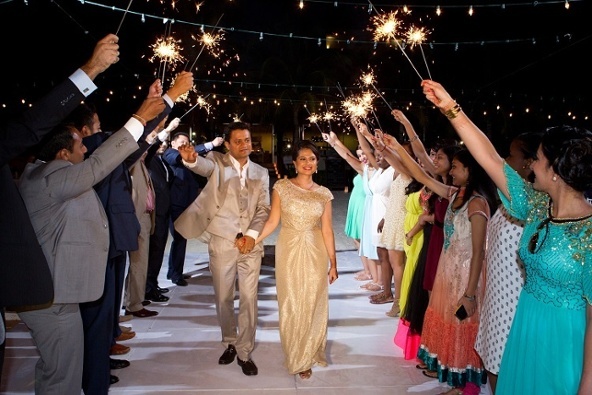 Best send off – We all know it’s true: sparklers are the best way to be sent off as official newlyweds! Priya & Jigar knew that to be true and their photographer was able to capture the magical moment as they took their first steps towards their romantic honeymoon…cheers to that! 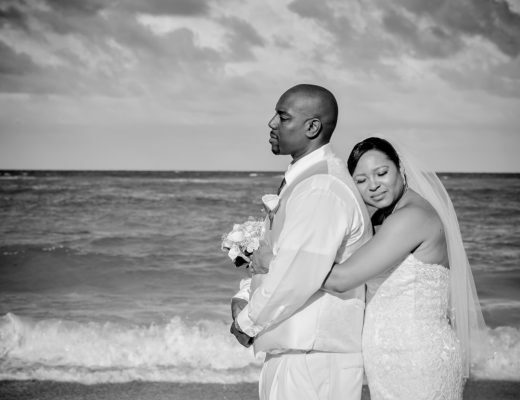 We love looking back on these memorable moments from our couples, and we look forward to celebrating many more in 2016!